Finding excuses not to use your patio? It’s time to revamp it. Whether you’re installing new limestone slabs or simply giving it a good scrub, act quickly to beat the spring rush and your patio will be looking gorgeous all summer. 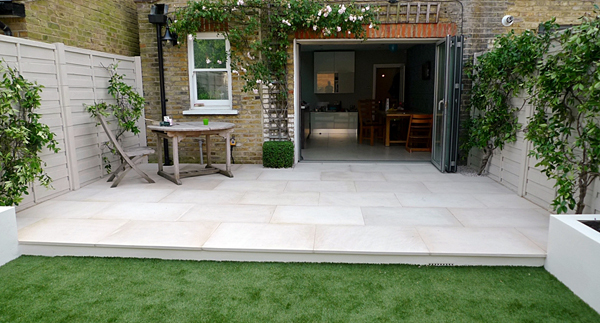 If you’re not sure whether you need to replace your patio, check out our top tips below. Stains, moss and debris are unsightly and can turn a pleasant patio into a drab outdoor space. Before investing in a pressure washer or a professional cleaning service, do a test scrub with household cleaners and a scrubbing brush. This will let you know if the marks can be removed, and also lets you make sure the products you’re using don’t affect the colour of your stone. Most outdoor stones are very tough, but even something rock-hard like limestone or concrete can be affected by abrasive cleaners. This is because the strong cleaners react with the stone and can cause pitting, discoloration and other problems. Another quick and easy way to make your patio more pleasant is to remove any bins, bikes and other clutter and add flowering plants in pots or beds. If you’re not much of a gardener, consider buying a ready-planted pot or two to brighten up your space. Not all issues can be solved with a quick wash and brush up. A patio or deck that has been improperly installed, poorly maintained or just unlucky can quickly turn into a hazard and should be replaced. Cracked tiles and uneven slabs can be trip hazards, while rotting wood can crack or break causing a fall or other injury. If just a few slabs have issues, you may not want to replace the whole patio. Unfortunately, weathering effects mean that even if you get the exact same type and colour of slab, limestone from the same quarry or the exact processed stone, it may look very different when it’s newly installed as it will be bright and fresh. A simple solution is to use slabs from the edge of the patio to replace broken slabs. A border of new slabs will look deliberate and fetching, even if you’ve replaced limestone with marble or grey with pink. Uneven paving slabs are typically caused by erosion beneath the tile. In some cases, it’s possible to lift a single slab and do remedial work underneath, but often large segments of the patio will need to be relaid after repairs to the foundation material. It’s best to deal with uneven slabs quickly, as even stones as tough as limestone or granite will crack or break if stressed for long periods. If your tiles are looking shabby and stained, replacing existing patio slabs with new ones is often easy enough to be a DIY project. Be aware that patio slabs are very heavy – limestone slabs can easily weigh 20kg each. This is as much as a heavy suitcase, and means that your car may not be able to safely carry very many in one trip. Surrey Marble and Granite can deliver, though, so talk to us about your patio slab needs! Granite is an inorganic material that has many of the appropriate conditions to let it be used as the surface material for kitchen worktops. It is one of the most used because of its features, among which are its hardness and heat resistance, resistance to water or moisture intake, and its anti abrasive or corrosive features – juices and liquids that are commonly used in everyday cooking are unlikely to harm it. Besides being very hygienic when well maintained, it is particularly durable and resistant to marks and stains.